Felines, A Homemade Raw Meat Cat Food? Why Do Our Felines Need A Homemade Raw Meat food Diet? Our Felines Are Dying Too Young! Your felines immune system has the ability to resist and recover from disease and injury. Their immune system regulates production of antibodies that aid in destruction of bacteria and viruses. By feeding a balanced home made raw meat diet you can help keep your feline or dogs immune system strong. “A growing number of vets are stating that processed pet food is the main cause of illness and premature death in the modern feline and dog. In December 1995, the British Journal of Small Animal Practice published a paper contending that processed pet food suppresses the immune system and leads to liver, kidney, heart and other diseases. This research, initially conducted by Dr Tom Lonsdale, was researched further by the Australian Veterinary Association and proven to be correct. Why do we choose the pet food we feed our pets? There are various answers to this question: a Friend or family member recommended a certain food and even a recommendation from the veterinarian. No matter who or what causes us to choose a pet food, the most important reason should be the quality of the food itself and what will keep our pet the healthiest. Cancer is now the leading cause of death in our pets today. It seems 20 to 25 years ago when I graduated from veterinary school it was not unusual to see cancer in a 13 to 15 year feline or dog. In fact it was accepted as almost normal since an animal at that age was geriatric. Now in the past 10 years we are seeing an epidemic of cancer in our dogs and felines, it is not in those geriatric animals, but in what I call the middle age animals (5 to 10 years old). It seems almost every day in practice, either I or one of the colleagues, I work with, sees one or more cases of cancer. In addition to cancer we are seeing an abundance of the other chronic diseases such as arthritis, skin problems, ear problems and immune mediated diseases. There is a plethora of information in the veterinary literature offering treatments for all these maladies, but I don’t hear much discussion about what is causing all these problems. I believe it a combination of diet, environment and genetics, but I put a heavy emphasis on diet because we all eat everyday. Even if you take the best genetic specimen (animal or human) on the planet and feed them a poor quality diet, genetics can not overcome the effects of poor nutrition. However if you take a pet with poor genetics and feed them a high quality diet the weakness in the animal’s genetics does not get an easy chance to express itself. For that reason I believe the main emphasis needs to be put on nutrition so we will begin our discussion. It is important to understand what Canines (canidae) and Felines (felidae) are anatomically. They are classified as carnivores. Carnivores according to Webster’s are animals that eat raw flesh (raw meat). If we were living in a utopian world, allowing our pets to go out and hunt for themselves would be the best. This is not practical, so we must consider our alternatives. How can one prevent the feline body from depleting its own supply of enzymes? “Cooked food is dead. Everything in a can or a bag is cooked. All processed foods for people or animals have been cooked, sterilized or pasteurized, which means all the enzymes that are needed to digest and utilize the food are destroyed. The saying “We are what we eat” is not exactly correct. We are what we utilize. Live food is essential for health. It is the ultimate source of life. There is no other way to be disease free. No matter who tells you that a certain brand of commercial food or home cooked food is healthy, it is not. It is dead; no enzymes, no friendly bacteria. Veterinarians, animal nutritionists, pet store owners, store clerks, authors of nutrition books or anyone else suggesting cooked foods are not familiar with what foods and supplements are necessary for health. If they were, they would not be prescribing, suggesting and selling cooked foods for carnivores. ALL canines and felines were designed to eat RAW food. The key to health is keeping live foods in the body. Live foods have enzymes, little protein molecules, which are essential for digesting food, for stimulating the brain, for providing cellular energy, for repairing all tissues, organs and cells, and functions so diverse that it is impossible to name them all. Animals and people cannot exist without enzymes. It is a myth that you can take supplements and make up for enzymes. Supplemental enzymes, vitamins and minerals can be very helpful, but they do not make up for RAW food. Commercial foods or home-cooked foods arc DEAD! Both dogs and felines are members of the class Carnivore, which means they are basically carnivorous animals, and evolved to get their nutrition primarily from raw meat, bones, and raw organs of the animals they could catch or scavenge. Dogs have been more opportunistic carnivores and can survive as omnivores. They would scavenge other animal’s prey, as well as hunting in packs, though wild dogs in Africa can reach speeds of more than 40 miles an hour, and have been known to chase prey for over an hour. Felines would catch smaller animals and rodents and both species would hunt, eat and then fast until the next hunt. The fact that both felines and dogs are true carnivores can be seen both by their digestive tract and teeth, as well as both feline and dogs having sharp claws for both hunting, and defense, as well as holding their prey for eating after that catch it. The feline cannot sustain its life unless it consumes meat in some form. Dogs, however, are able to survive on plant material alone, and they do not have to consume meat but they are by nature primarily meat-eaters and definitely do best when fed what their bodies have evolved to eat over many thousands of years. Just because by definition they are omnivores (can digest and utilize both plant and animal food sources) does not mean that plant material alone makes a good source of nutrition for the dog. This can be seen by studying their anatomy, physiology and behavior. As Kymythy Schultze points out “A true feline carnivore’s body has been designed to derive its needed nutrients from raw meat food. Cooked food takes longer to digest and therefore requires more of the felines energy. Heat also destroys enzymes and antioxidants, which are very important for good health. In fact, enzymes are needed for every biochemical activity in felines or dogs body. The body has a limited supply of its own enzymes. It is designed to consume enzymes in raw meats. When the pancreas is called upon to produce enzymes because the ingested cooked food has none, the pancreas must enlarge and work harder than it is de­signed to. Cooking food also transforms its essential fatty acids into trans fats dangerous toxins that weaken your pet. Heat destroys many vital amino acids, vitamins, and minerals. Vegetables for a felines or dog’s diet? In nature, felines,the true carnivores, would get a very tiny amount of predigested vegetation after capturing an herbivore that had already digested the vegetation. So remember that you are building a prey animal to your pet, which probably has a pretty small stomach, so you could provide steamed ground vegetables to the dogs meal as well as raw meat, to have a balanced homemade raw meat food that is as close to what mother nature would provide as possible. Felines however, don’t have the necessary enzymes to break down raw veggies so steam or cook them when making a homemade raw cat food recipe that calls for this; the squash family works best for felines. Anything we learn that brings us closer our animal friends enables them to live an optimal quality of life that contributes to the well being of us all. What Veterinarians are saying about the raw diet..
Do felines or dogs require grains in their diet? True carnivores (felines) cannot make a large quantity of amylase enzyme necessary to properly digest and utilize the carbohydrates. Amylase is the enzyme that is needed to break down grains. At the recent American Holistic Veterinary Medical Association Conference, I discovered that I am not the only one questioning the use of grains in commercial and home-prepared pet foods. Grains, such as oats, wheat, rice, barley, etc, are com­posed mostly of complex carbohydrates. They also contain some protein, fiber, B-­vitamins and trace minerals. However, they are NOT part of the natural diet of wild felines. In the true natural setting, grains hardly exist at all. Wild grains are much smaller than our hybridized domestic varieties. This means that even a mouse or other prey animal is not going to find much of its nutrition from grains. Therefore, the argument that “felines and dogs eat animals that have grains in their digestive tracts” doesn’t hold up to scrutiny. Prey animals that live near farms or other “civilized” areas are likely to have access to grains. This is not a truly wild raw meat diet. What other clues do we have that grains are not necessary for carnivores? 1.) Felines do not have dietary requirements for complex carbohydrates. 2.) Grains must be cooked or sprouted and thoroughly chewed to be digested; true carnivores do not chew much at all. Why have grains become so “ingrained” in pet feeding? To the best of my knowledge, grains were mainly introduced by the pet food industry. The high carbohydrate content provides CHEAP calories. In addition, grains assist in binding ingredients. We have become so used to feeding grains to dogs and felines that most of us get nervous when we decide not to use them. I know people who have been “grain-free” feeding and doing very well. My own feline is one example. What are the negative effects? I believe that carnivores cannot maintain long term production of the quantity of amylase enzyme necessary to properly digest and utilize the carbohydrates. In addition, the proteins in grains are less digestive than animal proteins. As a result, the feline and dogs immune system becomes irritated and weakened by the invasion of foreign, non­ nutritive protein and carbohydrate particles. Allergies and other chronic immune problems may develop. Short intestinal tracts and not enough amylase enzymes, cannot break down and use, the carbohydrates in the grains. The grains containing gluten, in the kibble causes chronic yeast infections. Grains have no Nutritional value. Grains are fiber ……. More stool! We feed more grains to our pet than we eat and they are true carnivores. “In the wild, no one cooks for the coyote or wolf; no one brushes their teeth. Their foods are raw and unprocessed.” “Processed foods and drugs have seriously depleted the natural vitality and immune systems of many pets. Whereas large amounts of red meat can cause cancer in humans, a lack of RAW red meat in an animal’s diet can lead to serious health problems. Animals require the enzymes, amino acids and other nutrients in the raw meat in order to stay healthy. Many skin and coat problems are a direct result of a lack of raw animal fat in the diet; fat which humans often believe is bad for their pet. Animals need at least 30% raw fat, and their systems are not designed to handle cooked meat or cooked fat. Restaurant grease has become a major component of feed grade animal fat over the last 15 years. Often held in 50-gallon drums for weeks or months in extreme temperatures. This grease is usually kept outside with no regard for its safety or further use. The rancid grease is then picked up by fat blenders who mix the animal and vegetable fats together, stabilize them with powerful antioxidants to prevent further spoilage, and then sell the blended products to pet food companies. Rancid, heavily preserved fats are extremely difficult to digest. And can lead to a host of animal health problems, including digestive upsets, diarrhea, gas, and bad breath. In the wild, a panther or jackal does not barbecue, grill or smoke its prey. 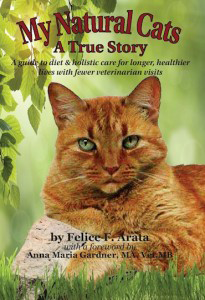 What Veterinarians are saying About the Raw Diet…. If you are transitioning your feline or dog to a homemade raw meat food diet, or if raw food is not the way you choose to feed your pet, you may want to consider adding Digestive enzymes to your pet’s diet. When pet foods are heat processed, as most are, enzyme concentration is significantly reduced. For this reason, adding digestive enzymes to your pet’s food will enhance absorption of nutrients. Feline Instincts’ add enzymes to all their products. Enzymes are destroyed during the heat processing of your pet’s food, yet are required for proper digestion. Concerned about salmonella and other bugs? The digestive systems of felines and dogs are short, acidic, and handle bacteria well. This is why they are not susceptible to salmonella, parasites, or e-coli from tainted meat as humans are. Humans have very long digestive tracks which allow food to ‘linger’ for 24 hours or more, thus allowing more time for parasites to get into their bloodstream’s. Most healthy dogs and felines can transition without difficulty immediately. Some benefit from a 7 to 10 day transition period. Where you mix their old food with the new raw meat diet foods, gradually reducing the quantity of old food and increasing the new until your feline or dog is eating all the homemade raw meat food. Felines by their very nature may not need transitioning at all. The main thing to remember is having patience! Up to a month into the homemade raw meat pet food diet, some felines and dogs bodies are ridding themselves of an accumulation of toxins from their former diet. These detoxes can happen periodically throughout the diet but should not last more than several days. After a period of detox you’ll notice that your fur friend looks and feels better than before the detox started. If your pet experiences symptoms similar to detox that last longer than a few days contact your Holistic vet and have them look at your pet to insure that it isn’t something other than a detox. Your vet can also add a remedy to help the detox go easier. Felines and dogs may go through a period of detoxification where they may experience loose or mucous stool, their coats may get worse before they get better, their eyes may begin to run or their ears might get gooey. Skin is even more itchy than nor­mal. All of these are positive signs..
90% of All Diseases In Animals Has To Do With Poor Diet. Once your pet is receiving the proper nutrition, you will see all the difference in the world, even if you thought you already had a healthy animal! A homemade raw meat cat food program will enable you to solve many of your felines’ ailments such as allergies, arthritis, ear and eye problems, heart, liver, kidney and bladder dysfunctions, skin and coat disorders, weight problems, constipation, diarrhea, indigestion, fleas, parasites and more that may have plagued your animals for months and years.